All of the qualifying rounds for the Creme de la King singing competitions will take place at Historic Main Street in Garden Grove, presented by the Garden Grove Downtown Business Association. Historic Main Street has provided a great venue for these contests and we thank them for all of their support and cooperation. The qualifying round dates for the Creme de la King competition will take place on Historic Main Street, on July 30th, August 6th, 13th, & 20th. In order to be eligible for that day’s competition, you must me signed up by the end of the sign-up period for that round. The order of performance for all rounds will be decided by random drawing. There will be a select panel of judges at each venue and at the finals. The KaraokeFest Creme de la King Finals will be held on Sunday, August 27th in conjunction with the 18th Annual Elvis Fest! Three (3) contestants will be selected from each qualifying round to compete in the Finals. 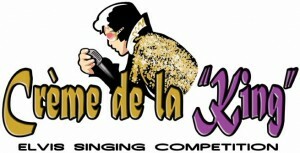 The KaraokeFest Creme de la King Finals will be held on Sunday, August 27th in conjunction with the 18th Annual Elvis Fest! The 1st, 2nd & 3rd Place Finalist will perform 2 songs at KaraokeFest 2017 at the LA County Fair!